I manage the Electron Microscopy Facility. 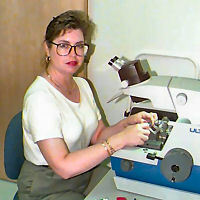 My duties include: the operation and maintenance of the electron microscopes, both a TEM and an SEM, and all the ancillary equipment; the processing of biological and non-biological samples, from the "raw" sample to the finished micrograph; the instruction of others in EM techniques. I am also the contact for ordering and dispensing ethanol for VIMS. Mason, P.L., Litaker, R.W., Jeong, H.J., Ha, J.H., Reece, K.S., Vogelbein, W.K., Stokes, N.A., Park, J.Y., Steidinger, K.A., Vandersea, M.W., Kibler, S., Tester, P.A. 2007. Description of a new genus of Pfiesteria-like dinoflagellate, Luciella gen. nov. (Dinophyceae), including two new species: Luciella masanensis sp. nov. and Luciella atlantis sp. nov. J. Phycol. In Press. Steidinger, K.A., Landsberg, J.H., Mason, P.L., Vogelbein, W.K., Tester, P.A., Litaker, R.W. 2006. Crypotperidiniopsis brodyi gen. et sp. nov. (Dinophyceae), a small lightly armored dinoflagellate in the Pfiesteriaceae. J. Phycol. 42:951-961. Litaker, R. W., Steidinger, K. A., Mason, P. L., Landsberg, J. H., Shields, J. D., Reece, K. S., Haas, L. W., Vogelbein, W. K., Vandersea, M. W., Kibler, S. R. & Tester, P. A. 2005. The reclassification of Pfiesteria shumwayae (Dinophyceae): Pseudopfiesteria, gen. nov. J. Phycol. 41:643–51. Reece, K.S. N.A. Stokes, W.K. Vogelbein, P.L. Mason, L.W. Haas, J.D. Shields, W.L Litaker, V.M. Foster, E.M. Burreson. 2000. Phylogenetic analysis and molecular diagnostics for Pfiesteria-like organisms. National Pfiesteria Conference, Centers for Diseases Control, Stone Mountain, GA, October. Reece, K.S., N.A. Stokes, W.K. Vogelbein, W.L. Litaker, J.D. Shields, L.W. Haas, P.L. Mason. V.M. Foster, and E.M. Burreson. 2000. Development and testing of molecular diagnostics for Pfiesteria-like organisms in laboratory and environmental samples. Symposium on Harmful Marine Algae in the U.S., Woods Hole, December. Mason, P.L., Lovko, V.J., and Vogelbein, W.K. 2000. Identification of Pfiesteria-like organisms by scanning electron microscopy. (Poster) National Pfiesteria Conference, Centers for Diseases Control, Stone Mountain, GA, October. Steidinger, K., J. Landsberg, R.W. Richardson, E. Truby, B. Blakesley, P. Scott, P. Tester, T., Tengs, P. Mason, S. Morton, D. Seaborn, W. Litaker, K. Reece, D. Oldach, L. Haas, and G. Vasta. 2000. Classification and identification of Pfiesteria and Pfiesteria-like species. National Pfiesteria Conference, Centers for Diseases Control, Stone Mountain, GA, October. Vogelbein, W.K., K.S. Reece, J.D. Shields, D.E. Zwerner, P. Mason, L. Haas and V.S. Blazer. 2000. Skin lesions in estuarine fishes: a comparative pathological evaluation of wild and laboratory-exposed fish. National Pfiesteria Conference, Centers for Diseases Control, Stone Mountain, GA, October. Vogelbein, W.K., K.S. Reece, J.D. Shields, D.E. Zwerner, P.L. Mason, L.W. Haas, and V. Blazer. 2000. Skin lesions in estuarine fishes: a comparative pathological evaluation of wild and laboratory-exposed fish. Symposium on Harmful Marine Algae in the U.S., Woods Hole, December. Vogelbein, W.K., V. Lovko, P. Mason, J. Shields, L. Haas, V. Foster and K. Reece. 2001. Pfiesteria shumwayae kills fish by direct feeding on epidermis, not toxin secretion. American Fisheries Society, Fish Health Section, Vancouver, Brit. Columbia, June. Steidinger, K., J. Landsberg, R.W. Richardson, E. Truby, B. Blakesley, P. Scott, P. Tester, T., Tengs, P. Mason, S. Morton, D. Seaborn, W. Litaker, K. Reece, D. Oldach, L. Haas, and G. Vasta. 2001. Classification and identification of Pfiesteria and Pfiesteria-like species. Envir. Health Prespec. 109(5):661-665. Haas, Leonard W. , Vicki L. Foster, Wolfgang K. Vogelbein, Jeffrey D. Shields, Kimberly S. Reece, Lisa A. Ott, Patrice L. Mason, and Vincent J. Lovko. 2002. The role of cysts in the vegetative growth of Pfiesteria shumwayae. 10th International Conference on Harmful Algae. St. Pete Beach, Florida. Mason, Patrice L., Wolfgang K. Vogelbein, Leonard W. Haas. 2002. An improved stripping technique for lightly armored dinoflagellates. 10th International Conference on Harmful Algae. St. Pete Beach, Florida. Vogelbein, Wolfgang K., Vincent J. Lovko, Jeffrey D. Shields, Kimberly S. Reece, Leonard W. Haas, Patrice L. Mason, and Calvin C. Walker. 2002. Pfiesteria shumwayae kills fish by myzocytosis not exotoxin secretion. 10th International Conference on Harmful Algae. St. Pete Beach, Florida. Vogelbein, Wolfgang K., Vincent J. Lovko, Jeffrey D. Shields, Kimberly S. Reece, Patrice L. Mason, Leonard W. Haas and Calvin C. Walker. 2002. Pfiesteria shumwayae kills fish by micropredation not exotoxin secretion. Nature. 418:967-970. Mason, Patrice L., Wolfgang K. Vogelbein, Leonard W. Haas, and Jeffrey D. Shields. 2003. An improved stripping technique for lightly armored dinoflagellates. J. Phycol. 39:253-258. Free-hand artist and published illustrator, needlework, fine arts, antiques, reading, cooking and indoor plants.